"Gad will be attacked by a band of raiders, but he will attack them at their heels." "...Blessed is he who enlarges Gad's domain! He lives there like a lion, tearing at arm or head. He chose the best land for himself; the leader's portion was kept for him. when the heads of the people assembled, he carried out the Lord's righteous will, and his judgments concerning Israel." Click on a link below to view that section of this page. When discussing the allotment of land granted the tribe of Gad, it is important to note this was the only allotment which was handed out by Moses; before he died, and before the Israelites had crossed the Jordan River. J. McKee Adams published a wonderful book in 1965 entitled Biblical Backgrounds. He appoints the tribe of Gad's allotment as falling within the first "period" of "three general divisions and periods" of the Conquest. This first period was the allotment of land east of the Jordan River to the tribes of Reuben, Gad, and the half-tribe of Manasseh, or East Manasseh. As pointed out earlier, Moses himself handed out this allotment. This was also unique in that these were the only three tribes with land east of the Jordan, and these three tribes sought out their land, whereas the remainder of the tribes were assigned land west of the Jordan by Joshua. The portion obtained by this tribe rested north of the tribe of Reuben. The Jordan River bordered their land to the west. The kingdom of the Ammonites lie to the immediate east. A thin section of land fell within the tribal borders which stretched northward, through Gilead, all the way up to the southeastern shores of the Sea of Galilee, or Sea of Chinneroth. The southern boundary, it seems, reached to Heshbon. However, the heartland rested in the mountainous region of Gilead. The tribe of East Manasseh shared this region. The city of Manahaim sat on the border. The region is characterized by beautiful mountain country. Adams describes it as more "rolling than either Moab or Bashan". Because of the Gadites proximity to the Jordan River, it was more involved with the western tribes of Israel than the other Transjordan tribes of Reuben and East Manasseh. Their land, as well as those of all the Transjordan, was much more adequately supplied with water than the western tribes. Streams consistently carried water throughout the land, breaking from tablelands, hills, and mountain slopes, gathering in valleys, and winding its way towards the Jordan Rift Valley and the Dead Sea. The Yarmuk, Jabbok, and Arnon rivers were the three primary rivers in the Transjordan. These waters would also provide an ample water supply for their large herds and flocks. 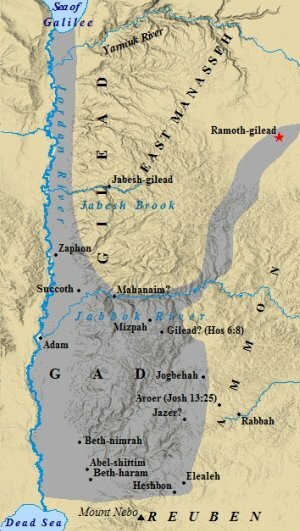 The Yarmuk and Jabbok gathered tremendous amounts of water from the Bashan highlands, and in northern Gilead, and emptied its supply into the Jordan. The Jabbok river finds its principal source near Rabbath-ammon. Rabbath-ammon, or modern day Amman, Jordan, is called "the city of waters" in the Old Testament. Extremely fertile land characterized the inheritance. Gad had very rich pasture lands, which the Bible states were well suited for their large herds and flocks. Dense forests sat along the rugged western slopes of the Transjordan Plateau. Nadav Na'aman differentiates the territories of Gad and Reuben in describing the location of the Biblical Mishor, or "plain". Na'aman argues the Mishor extended north of the Arnon River, up to the southern border of Ammon. The major towns of this area, which also fell within the tribe of Reuben, were Medeba and Dibon. The territory of Gad, however, fell within the region which would later become the Assyrian Transjordanian province. The Mishor and Assyrian Transjordan Province, like the two tribes, bordered each other. This Assyrian Province included the town of Abel-shittim. Shittim is near Beth-haram and Minnith, both located at the southwestern border of Ammon. The Israelites camped in Shittim before entering Canaan. This line effectively separates the Mishor and Reuben's allotment from that of their brethren to the north. The tribe of East Manasseh would occupy the land of Bashan, which lie to the immediate north and east. As stated above, the tribes of Gad and Manasseh both shared the land of Gilead. Ironically, their territory, it would seem, was not in God's original plans for the tribe to possess. Though this is purely conjectural, it is consistent with the Biblical narrative. Their land was gained only after the victories over the Amorite/Rephaim kings Og and Sihon. These victories were not intended to be battles in the first place. Indeed, all the Transjordanian tribes occupied land which Scripture seems to imply was not on the initial agenda for Israelite conquest. Based on the blessing of Moses, it would seem that the tribe played an integral role in the battle with the Amorite king Sihon, recorded in Numbers 21:21-35. In that blessing Moses stated that "the leaders portion was kept for him". Precedence for tribes being awarded land based on exploits can be found in Caleb. Caleb was faithful in reporting about the Anakim and other Canaanites, and feared not their size and strength. He faithfully drove them out from Hebron and Jerusalem, and the surrounding areas. Joshua gave him this land as promised by Moses (Joshua 14), for himself and his tribe, the tribe of Judah. This seems to be the situation in regards to the Transjordan tribes. Moses had led the Israelites out of Kadesh-barnea, where they had been camped for some time. The traditional location of Kadesh-barnea is in the Wilderness of Zin, south of the Negev, and on the western side of the Dead Sea. The Arabah lay to the east, as did Edom, traditional enemies and descendants of Esau. However, there are convincing arguments which place Kadesh-barnea (as well as the Wilderness of Zin) in the Transjordan, east of the Arabah, southeast of the Dead Sea. This argument favors the site of ancient Petra as the Kadesh-barnea of the Old Testament. 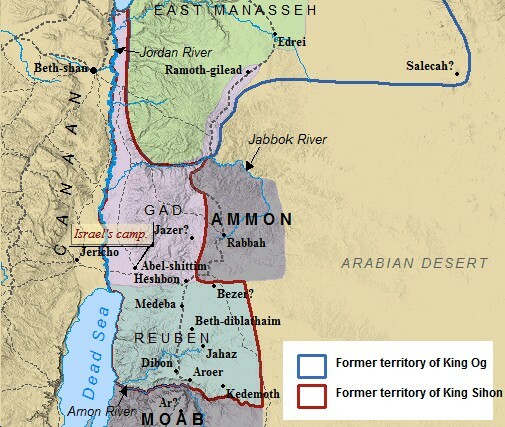 Proponents of this view cite two principal reasons for their locating Kadesh-barnea in the Transjordan. "Your southern section shall extend from the wilderness of Zin along the side of Edom..."
This would certainly include the traditional site of Kadesh-barnea. If this were the case, then Moses would have dwelt in the Promised Land long before he died, which, of course the Bible states clearly Moses never sat foot in the Promised Land. The second reason is found in Judges 11:16. "But when they came up out of Egypt, Israel went through the desert to the Red Sea and on to Kadesh." The argument rests in the chronology and geography of the places mentioned, matching up with Kadesh being placed in the Transjordan. A look at the map will show that out of Egypt, the Israelites faced the imposing Sinai desert. Traveling east across the desert, the Israelites would have arrived at the Red Sea. From the Red Sea, the Israelites d would have traveled to Kadesh. Petra seems like a logical location for Kadesh, and fits with their east - northeast travel pattern. Following the progression and direction of the Israelites out of Egypt, traveling east - northeast, it would seem the verse implies Kadesh was in the Transjordan. The Exodus and its route, however, is one of the most fiercely debated topics in all of the Bible. It was in Kadesh Moses struck the rock, disobeying God, and was forbidden from entering the Promised Land (Numb. 20). Near modern day Petra, there is a strip of channeled down rock called "the wadi of Moses". The site is very ancient. Eusebius wrote in 325 AD Petra was the site of Kadesh (Quayle). The movements of the Israelites from Kadesh are contested as well. 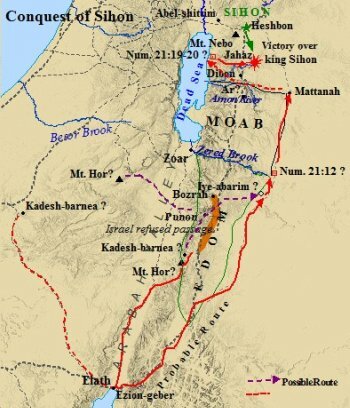 Different routes seem to be described in the Biblical narrative, as depicted in the map below. However, there is consistency as to what happened once they had traveled through (or around) Edom and Moab. Israel was encamped in a valley near Bamoth and Moab, "where the top of Pisgah overlooks the wasteland" (Nu. 21:20). Their camp was very close to Mt. Nebo, where Moses would view the Promised Land, die, and be buried in a hidden grave. However, the mighty army of the Amorite king Sihon stood in the way of conquest. Sihon ruled the land north of the Arnon River, constituting what would become the allotments of the tribes of Gad and Reuben. He had overthrown the former king of Moab, and taken that territory as his. His capital was at Heshbon. Moses sent messengers to King Sihon of the Amorites in Numbers 21:21. "Israel sent messengers to Sihon king of the Amorites: 'Let us pass through your country. We will not turn aside into any field or vineyard, or drink water from any well. We will travel along the King's Highway until we have passed through your territory." Moses sought a peaceful encounter with Sihon. It was not in God's plan for the Israelites to attack and conquer these people. Sihon seemingly turns an oblivious ear to the Israelite plea. Scripture does not give any indication as to why Sihon refused their request. Steve Quayle has done an extensive study on Og and Sihon. Ancient Rabbinnic literatures and text such as Nidda 61a, Midrash Agadah, Hukkat (Quayle), speak of Sihon as the warlord over all of Canaan. Sihon as a warlord over Cannan seems to fit with his refusal for the Israelites to pass through his land. His preemptive strike was an attempt to prevent Israelite invasion and destruction of his vassal kingdoms in Canaan. It was an act of self-preservation in a sense. Numbers 31:8 and Joshua 13:21 speak of Midianite kings that paid Sihon tribute. These ancient Rabbis claim he is "the Canaanite king of Arad" found in Numbers 22:1. His influence and might was widespread, far more than that of his giant neighbor king Og of Bashan. Sihon was also said by the rabbis to have been a brother to Og; and those two grandsons of the fallen Watcher Shamhazai, mentioned in the book of Enoch. Og and Sihon are mentioned together throughout Scripture in the books of Nehemiah and Psalms, as well as Numbers, Deuteronomy, Joshua, Judges, I Kings and Jeremiah. They are mentioned far more than any other kings of the conquest the Israelite army encountered. All indications are the fierce tribe of Gad was at the forefront of the battle with these two kings. Sihon's army was an impossible obstacle to Moses and his people. Archaeological artifacts have been found depicting Amorites as towering above vanquished foes, and they are often associated with oaks and cedars. Amorites were of great stature and cruel and ruthless warriors. Sihon belonged to the Rephaim, an even fiercer people associated with the Nephilim. Sihon's menacing response is recorded in Numbers 21:23. It sets the stage for the heroics of this tribe, as stated by Moses in his blessing. "But Sihon would not let Israel pass through his territory. He mustered his entire army and marched out into the desert against Israel. When he reached Jazer, he fought with Israel." One must wonder if "his entire army" included drafted military units from his many vassal kingdoms, both east and west of the Jordan. If this were the case, then his army would have numbered, perhaps, in the tens, if not hundreds of thousands. Regardless, it would have been a huge foe, both in stature and number. The map of the battle indicates Sihon did not wait for the Israelites. He marched his army south to Jazer. Likely that is simply the place the two marching armies met. Moses was marching east to meet up with the King's Highway, a major roadway of the ancient world. Sihon was marching south from his palace in Heshbon to block the advance. The two collided at Jazer. "Israel, however, put him to the sword and took over his land from the Arnon to the Jabbok, but only as far as the Ammonites, because their border was fortified." The Israelites captured all of the cities of the Amorites, including Heshbon, "the city of Sihon". This was a miraculous victory, authored by none other than the power of God Almighty; the God of Abraham, Isaac, and Jacob. This was a prime opportunity for God to test the faithfulness of His people. All indications are, though angry at Moses for striking the rock, God still had confidence in His servant. His people, however, were always in question. The tiny band of desert wanderers engaged the warlord of all the land, in their first major military encounter of any significance in forty years. More so, they soundly defeated Sihon's army, put Sihon to the sword, then re-settled his cities! Deuteronomy 3 gives more of an in-depth account of the defeat of Og and Sihon, and the land divided amongst the Transjordan tribes. The total destruction of Og and Sihon is fully revealed by Moses in this passage. From Og they left no survivors, taking all of Og's sixty cities. After striking down all men, women and children, Gad and the Israelites took the livestock and plundered the cities for themselves. Their destruction of Sihon was total. Moses states they destroyed "every city - men, women and children". They plundered Sihon's cities and livestock as well. The campaigns proved exceedingly profitable for the Israelites, and completely fatal to Sihon, Og, and their kingdoms. Moses goes on to describe the boundaries of the land taken in Deuteronomy 3:8. He states they took the territory east of the Jordan river, from the Arnon Gorge in the south, as far north as Mount Herman. They took over all the towns on the plateau which extends across the land, and all of Gilead, as well Bashan, as far as Salecah and Edrei to the east. 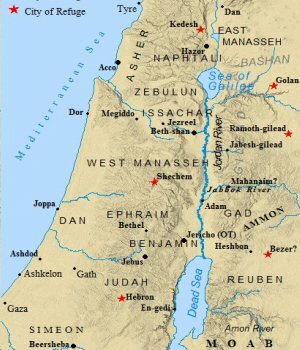 The western border, according to Moses, extended from the Sea of Galilee, termed both Chinneroth and Kinnereth in the Old Testament, to the Dead Sea, "below the slopes of Pisgah". To the Reubenites and Gadites Moses gave the territory extending from Gilead, which runs parallel to the Jordan valley, south to the Arnon Gorge. The middle of the gorge was said to have been the border of the two tribes. From there the land ran out to the Jabbok river in the east, which was the border of the Ammonites. Moses states that half of Gilead went to Gad, with the other half going to East Manasseh. In essence, the Gadites and Reubenites occupied the kingdom of Sihon, whereas the tribe of East Manasseh occupied the kingdom of Og. However, this land would be given only if they remained faithful throughout the rest of the conquest. Immediately following Sihon in Numbers, the tribe of Gad and Israel is challenged again by Og, king of Bashan. His kingdom was in the line of fire, and he knew it was coming. God assured Moses in verse 34. "Do not be afraid of him, for I have handed him over to you, with his whole army and his land. Do to him what you did to Sihon king of the Amorites, who reigned in Heshbon." This tribe's role in these two great Israelite victories are implied in the opening verses of Numbers 32. Verse one gives some detail concerning the makeup of the tribe, and their wealth as well. "The Reubenites and Gadites, who had very large herds and flocks, saw that the lands of Jazer and Gilead were suitable for livestock." Scripture plainly states they possessed "very large" herds. In an episode to be discussed later, these men, along with Reuben and half-Manasseh, confiscated 500,000 camels, sheep, and donkeys from vanquished foes (I Chr. 5:21). Gad was a wealthy tribe, and had large holdings. It was necessary, thus, that they possess a large amount of land. The land must also be able to sustain an extremely large population, most of which were grazing animals. The land of Sihon and Bashan fit their needs perfectly. God, after all, did know Sihon and Og would refuse passage, and used their insolence to His benefit. He had just the plan in mind for this newly conquered land. As mentioned previously, Moses had promised land to Caleb as a reward for his faithful report concerning the land of Canaan. The elders of the Transjordan tribes saw an opportunity to possess extremely rich and fertile land, already built up with great cities. Perhaps they felt the precedent for such a request had been set by Caleb, thus they approached Moses. Their role in the battle gave them the right to make such a request. More importantly, it would seem Moses would be more inclined to grant this request to a tribe which had played an integral part in the battle. Their request is made in Numbers 32:3-5. "Ataroth, Dibon, Jazer, Nimrah, Heshbon, Elealeh, Sebam, Nebo and Beon-the land the Lord subdued before the people of Israel-are suitable for livestock, and your servants have livestock. If we have found favor in your eyes,' they said, 'let this land be given to your servants as our possession. Do not make us cross the Jordan." The tribes appear modest and humble in their request, though the last line incites Moses and the Lord to anger. They did give the glory of victory to God, rather than boast in their strength. In describing their herds, they simply stated they had livestock, not "large", or "exceeding". And lastly, they asked in such a way as to seek the favor of Moses; if he thought they were worthy would he grant them this request. However, their last statement seemed to imply they wanted to stop their role in the conquest right then and there, leaving the other tribes to fend for themselves. Moses took this as their intent as well, for his response was a blistering accusation against the Transjordanian tribes, as recorded in Numbers 32:6-14. Moses asked if their countrymen shall go to fight while they sit. He accused them of discouraging "the Israelites from going over into the land the Lord has given them". Moses then recalls the sin of their fathers', apparently those spies he had sent into Canaan from Kadesh-barnea around 40 years ago. Their reports had been unfaithful, and God had punished them for their lack of faith. Moses reminded them of Caleb's faithfulness, as compared to their fathers sin. In verse 14 Moses called Gad, Reuben, and Manasseh a "brood of sinners", and accused them of "making the Lord even more angry with Israel". 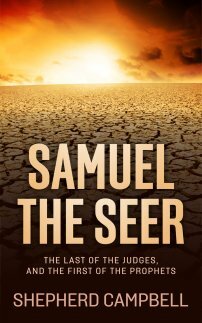 He warned Gad if they chose to remain behind, "you will be the cause of their destruction." To the credit of these three tribes, they quickly re-evaluated their position, and informed Moses in verse 17 "we are ready to arm ourselves and go ahead of the Israelites until we have brought them to their place.". They had only asked if their women and children could stay behind and settle the land. They requested no inheritance from the west side, but stated this shall be their inheritance. Moses agreed that if they would arm themselves, and battle with their brethren, then they could posses the land of Sihon and Og. All indications are that the Gadites exceeded even the expectations of Moses. Their feats must have been remarkable, and seem to lend credence to the theory they played a significant role in the victories over Sihon and Og. The blessing of Moses leaves no doubt as to the faithfulness Gad exhibited throughout the remainder of the conquest. "About Gad he said: 'Blessed is he who enlarges Gad's domain! Gad lives there like a lion, tearing at arm or head. He chose the best land for himself; the leader's portion was kept for him. when the heads of the people assembled, he carried out the Lord's righteous will, and his judgments concerning Israel." Moses called the tribe a lion, tearing his foes from limb to limb. As lions are territorial, so was this tribe, choosing and protecting the "best land for himself". No land, however, could be granted without the approval of Moses, who ultimately carried out the will of God. Thus, it would seem when Moses made the reference to the "leader's portion", it may imply this tribe was the lead tribe in the attack on Sihon, Og, and in the conquest west of the Jordan, including the battle of Jericho . This, of course, is theoretical, yet does not contradict, nor discredit, the Biblical account. In fact, it is consistent with the feats and exploits in later battles and uprisings. They were a fierce tribe of proud warriors. This would prove to be a useful trait, as their land sat in the midst of enemies. Consequently the tribe built up a number of fortified cities throughout their allotment. Immediately after agreeing to Moses's terms, Scripture describes the tribe as building, or fortifying, a certain number of cities within their allotment. This list is found in Numbers 32:34-36. "The Gadites built up Dibon, Ataroth, Aroer, Atroth Shophan, Jazer, Jogbehah, Beth Nimrah and Beth Haran as fortified cities, and built pens for their flocks." More cities are listed in Joshua 13:24-28. "This is what Moses had given to the tribe of Gad, city by city: The territory of Jazer, all the towns of Gilead and half the Ammonite country as far as Aroer, near Rabbah; and from Heshbon to Ramath Mizpah and Betonim, and from Manahaim to the territory of Debir; and in the valley, Beth Haram, Beth Nimrah, Succoth and Zaphon with the rest of the realm of Sihon king of Heshbon (the east side of the Jordan, the territory up to the end of the Sea of Kinnereth). These towns and their villages were the inheritance of the Gadites, clan by clan." Other cities Scripture lists within the territory include Karkor in Judges 8:10; Salcah in Deuteronomy 3:10; and Nimrim in Isaiah 15:6. In his book of collected essays entitled, Ancient Israel & Its Neighbors, Nadav Na'aman asserts that the town of Beth-haram was located at Tell Iktanu, which rests south of the Wadi el-Kefrein (51). He goes further and states the town of Jazer may be identified with modern day Tell el-Aremeh (51). As stated above, Abel-shittim also rested within their borders. From the tribe of Levi, the Merarite clan inherited four towns from the tribe of Gad. These Levitical cities are listed in Joshua 21:38-39. "from the tribe of Gad, Ramoth in Gilead (a city of refuge for one accused of murder), Manahaim, Heshbon and Jazer, together with their pasture lands - four towns in all." One of six cities of refuge were located within the tribes boundaries; that city being Ramoth-gilead. These cities were peppered throughout the whole of the land in Israel. Three cities of refuge rested on the eastern side of the Jordan, and three cities of refuge were located on the western side of the Jordan. This tribe was the central of the three Transjordan tribes, thus it was only natural for a city of refuge to be found within its borders. Manahaim is a fitting city for the Levites to inherit. If one will remember, it was at Manahaim that "the angels of God" met Jacob before his feared reunion with Esau in Genesis 32. God strengthened and encouraged His servant Jacob here. Jacob named the place "the camp of God", which translates as Manahaim. Shortly after leaving Manahaim, Jacob wrestled with God at Peniel. This was a sacred area to the Israelites. A fact not lost on Moses nor the Levites which settled the city and its surrounding area. The people would have been fully aware of the traditions and divine miracles associated with these places. These cities stood then, as they do today, as a testament to the power and wonder of God Almighty. The Israelites left Egypt in haste. Moses had warned them the night before to be ready to depart at once. Thus, as they set out, preparations seem to have been made in haste. Very little time was given to the organization of the Israelites, and how and when they were to leave, and in what order, or structure, their migration would take. Exodus 12:33-34 records the departure of Israel from Egypt. "And the Egyptians urged the people, to send them out of the land in haste, for they said, 'We shall all be dead.' So the people took their dough before it was leavened, with their kneading bowls bound up in the clothes on their shoulders." God, however, was not to leave His people wandering in the desert with no direction, no structure, no hierarchy for solving disputes and issues. God would lay the foundation for the future self-government, and the unification of the 12 tribes of Israel upon settling Canaan. He gave Moses strict and explicit instructions on how the Israelites were to set up camp, where each tribe was to camp around the Tabernacle, and the order they were to break camp upon leaving a location. These instructions are found in Numbers 2. 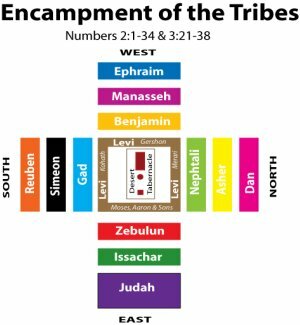 The 12 tribes of Israel were divided into four camps, with each camp consisting of 3 tribes. One tribe was assigned the leadership of the camp, and was responsible for overseeing the functions of their particular camp. As Israel set up camp in the wilderness, these four camps would encamp on the north, south, east, and west of the Tabernacle. 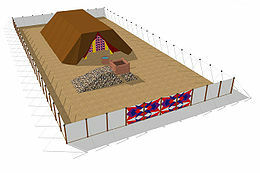 Moses, Aaron, and the Levites encamped within the Tabernacle compound itself, with the other tribes surrounding the Tabernacle. Moses instructed the tribe of Gad they were to be included within the camp of Reuben. This meant the tribe of Reuben would be the leading tribe, responsible for overseeing the other tribes within their camp. Their orders are given in Numbers 2:14-15. "Then comes the tribe of Gad, and the leader of the sons of Gad: Eliasaph the son of Deuel, and his army, even their numbered men, 45,650." They encamped on the southern side of the Tabernacle. As the tribes set up camp, Reuben would set up first, then came the tribe of Simeon, and lastly the Gadites set up camp beside Simeon. This army numbered a total of 151,450 fighting men. Of the four camps, this was the third largest camp of fighting men. As the Israelites broke camp, the camp of Reuben would break camp second. The camp under the leadership of Judah broke camp first. Once Judah and company broke camp, next came the camp of Reuben. Though Scripture does not state the order of marching within the camp of Reuben, it would seem logical they would break camp in the order they set camp. Numbers 1:14 lists the leader of the army of Gad, as stated above. This man is said to have been Eliasaph, son of Deuel. This man would have been their commander, the one responsible for alerting the tribe when to pitch camp, and break camp. He would have led the army in battle. Later in the book of Numbers, Eliasaph presents the tribal offering. God hand picked these men, and gave their names to Moses. These men, according to the word of the Lord to Moses, "are the names of the men who shall stand with you". These men were surely Godly men, righteous men, concerned with the commandments of God. It would seem God would choose some of the most faithful men within each tribe to be leader. Thus, God had begun the transformation of a loose band of desert migrants, to what would become a powerful and influential kingdom. He was the seventh son of Jacob, bore to Zilpah, Leah's handmaiden. Scripture records that Leah had stopped giving birth, after birthing the first four sons of Jacob. Rachel, becoming jealous, had struggled with God and Leah about this, as recorded in Genesis 30:6. Rachel gave her handmaiden Bilhah to Jacob, and he conceived two sons with her. This made Leah jealous, naturally. Leah's actions are recorded in Genesis 30:9-10. "When Leah saw that she had stopped bearing, she took her maid Zilpah and gave her to Jacob as a wife. And Leah's maid Zilpah bore Jacob a second son." This son was Gad, and his birth is recorded in Genesis 30:10-11. "And Leah's maid Zilpah bore Jacob a son. Then Leah said, 'How fortunate!' So she named him Gad." The meaning of the name has been interpreted in two ways. The King James Version gives the following meaning in Genesis 30:11. "And Leah said, A troop cometh: and she called his name Gad." The King James, thus, interprets the meaning "troop", or, "a troop is coming". However, the New American Standard Bible, and the New International Version, have different interpretations. The NASB reads as following in the same verse. "Then Leah said, 'How fortunate!' So she named him Gad." The NIV is similar in its' interpretation. "Then Leah said, 'What good fortune!' So she named him Gad." The meaning in both the NASB and NIV is "fortune", or "fortunate". However, in the KJV Gad is translated as "troop", or, "a troop is coming". The NIV adds a footnote to the verse which states; "Gad can mean good fortune or a troop. Henry Morris, in his book The Genesis Record, states that the name is associated with a pagan god of luck. The association is with a North Arabian deity of fortune. This god is part of the Phoenician and Syrian pantheon. However, in this instance Leah seems to be using the name as a means to express her good fortune of having another son. The confusion of the name rests in the fact it also comes from the Hebrew word guwd. This word translates as: "to crowd upon, "attack", invade, overcome. The tribe would indeed become fierce warriors, as stated above. However, it is unlikely Leah had this in mind upon the birth of her son. Thus, it would seem, perhaps, Leah had intended to express her good fortune from God with the birth of Gad, thus she named him something to express her happiness and good luck. This, of course, is speculation. However, it would be consistent with the feeling parents have upon the birth of a child. Leah had no way of knowing at the time, short of God revealing to her (which Scripture never records), that this son would become a tribe of warriors. Thus she named him in order to express her joy or "fortune". This son is silent throughout the narratives in <b>Genesis</b> covering the actions of Jacob's sons. His absence in the Joseph narrative is an indictment he went along with the original plan to kill his brother Joseph. Later, upon the urging of Reuben, the brothers changed their minds, and sold him to slavery, rather than kill him. Gad seemingly went along with his brothers plans. Gad, along with the other brothers of Zilpah and Bilhah, may have been involved in a negative incident in Genesis 37. This passage, however, is very vague and few details are given. The involvement of Gad is gleamed from contextual evidence. The evidence is found in verse 2. "This is the account of Jacob. Joseph, a young man of seventeen, was tending the flocks with his brothers, the sons of Bilhah and the sons of Zilpah, his father's wives, and he brought their father a bad report about them.'. Scripture plainly states that Joseph was tending the flocks with "the sons of Bilhah and the sons of Zilpah". This would have included Dan, Naphtali, Gad and Asher. The remaining brothers from Leah and Rachel, Reuben, Simeon, Levi, Judah, Issachar and Zebulun, by implication, seem to be absent. Benjamin had not yet been born. Joseph is recorded as reporting back to Jacob a negative report about his brothers. What this report was is not told. Whatever the brothers were guilty of, they clearly did not intend for it to get back to Jacob. Gad, by implication, would have been involved in this incident. He would have naturally built up resentment and bitterness towards Jospeh for his bad report. Nobody, after all, likes a tattle-tale. Joseph, however, felt impelled to tell his father. This may indicate some serious infraction or transgression on the part of his brothers. This incident would have provided the motive for to rid themselves of their younger half-brother. As the narrative unfolds, Judah and Reuben emerge as the main characters, for they are the only two Scripture mentions. The others, apparently, went along with the plot, probably willingly. After all, Joseph had told on all of them to Jacob, which surely must have brought the wrath of Jacob down on his wayward sons. Genesis 42 mentions another incident in which Gad would have been involved, though not mentioned specifically. A famine had come down hard on Canaan. The residents of Canaan were going to Egypt in order to purchase grain from the royal granaries. Jacob, seemingly, had held out for as long as possible. However, the trip to Egypt was inevitable, as seen in verse 1. Gad accompanied his other brothers on the trip to Egypt. He would have been present when they encountered Joseph in Egypt. Only Benjamin was left behind, though Joseph would summon for him to be brought to Egypt in testing the character of his brothers. Further insight is given in Genesis 46. This chapter is describing those that went to Egypt with Jacob. His party is numbered at seventy. Each son is listed, as well as the families of that particular son. Those accompanying Gad to Egypt are listed in Gen. 46:16. "The sons of Gad: Zephon, Haggi, Shuni, Ezbon, Eri, Arodi and Areli." Only Benjamin had more sons with nine. Further description concerning Gad and his family is given in Numbers 26:15-18. This passage lists the clans through each of his seven sons. Through Zephon came the Zephonite clan, Haggi produced the Haggite clan, Shuni the shunite clan, Ozni (Ezbon) the Oznite clan, Eri the Erite clan, Arodi the Arodite clan, and Areli the Arelite clan. All together, the clan of Gad consisted of 40,500 people. Gad, as the father of the family, stood at the head of the house. Numbers 1 opens up with the first census Moses was instructed to take of the Israelites. The tribe of Gad, according to verses 24-25, possessed 45,650 men. This number, however, did not include all the members of the tribe. The census was taken to gather the number of men "twenty years old or more who were able to serve in the army". In this passage, as previously stated, Eliasaph was chosen as the leader of the tribe. These men, according to verse 5, were to "assist" Moses. The Scripture does not list specific areas they were to assist in. The presumption is that these men helped Moses in any way he needed. In Numbers 13 Moses is instructed to appoint spies from among the tribes to search out the land of Canaan. From this tribe, Geuel, the son of Maki, was chosen. Again, though the tribe is not mentioned specifically, they exhibit a lack of obedience to God. Geuel was one of the spies which reported the inhabitants of the land were too powerful, and the cities too big for Israel to conquer. The Bible records only Joshua and Caleb remained faithful in their reports to Moses. As discussed above, Caleb was rewarded the land which would become Judah for his faithfulness. Joshua ascended to the leadership of all Israel. The other spies, however, turned the hearts of the Israelites to fear and anger. They even threatened to stone Caleb and Joshua. Moses, once again, interceded on behalf of the people, as God sought to destroy them. The next appearance of this tribe occurs with their conquest of Sihon and Og (see above). Though guilty of transgression in certain passages, these men proved faithful and seem to have redeemed themselves in the eyes of Moses throughout the battles east of the Jordan and the remainder of the Conquest west of the Jordan. After their successful campaigns east of the Jordan, the Transjordanian tribes joined the remaining Israelites in the conquest west of the Jordan. A passage from Deuteronomy 3:18 states how these three tribes were to not only fight with their brethren, but be the lead tribes in the upcoming battle. "I commanded you at that time: 'The Lord your God has given you this land to take possession of it. But all your able-bodied men, armed for battle, must cross over ahead of your brother Israelites." Moses goes on to state that the women, children and livestock of Gad may stay behind and occupy the towns and villages. Once the Conquest was complete, then the men may return as well. The implication of this verse is that the Transjordan tribes were the lead tribes in the battle of Jericho. They were also to play key roles in the future battles against the Canaanites. Jericho, however, loomed on the horizon. The Bible does not list which tribes marched first in the battle of Jericho. However, two chapters earlier, in Joshua 4, the order of procession is given as the Israelites approached Jericho, after their miraculous crossing of the Jordan. God had just blocked the waters of the Jordan up to Adam, north of Jericho, in order for the Israelites to cross the Jordan river to the plains of Jericho. The order of procession is given in verse 12. "The men of Reuben, Gad and the half-tribe of Manasseh crossed over, armed, in front of the Israelites, as Moses had directed them. About forty thousand armed for battle crossed over before the Lord to the plains of Jericho for war." Scripture makes it plain the Transjordan tribes led the nation across the Jordan. Naturally, it would not be too presumptuous to state they were the lead tribes during the war. When they crossed, they were ready to fight. The Bible explicitly stated they were armed for war. If this were the case, then they would have been part of what formed the "armed guard" in Joshua 6:9. The armed guard was to march ahead of the seven priests blowing trumpets of rams' horns. These seven priests marched in front of the Ark of the Covenant. Behind them marched the rear guard. This would have been a tremendous honor for the Transjordan tribes. However, it was also the fulfillment of their obligation to God. This was an act of obedience and faithfulness on their part. It was no easy obligation. To the tribesmen, as well as the rest of the Israelites, Jericho seemed an impenetrable fortress. Though the archaeology of Jericho is another hotly debated topic, it has been proven the walls of Jericho were indeed massive. One of the controversies of Jericho involves the time period of when these walls date. Many scholars say they pre-date Joshua's invasion of Jericho. Such evidence often rests soley on dating techniques, which are, at best, debatable. Regardless, the Transjordan tribes would have been the first tribes to encounter the walls of Jericho up close and personal. As Scripture records, the battle of Jericho was a thorough victory for the Israelites. They destroyed the city, and everything in it, as well as all of the occupants, save Rahab the harlot. It is likely at least a part of the tribe was involved in the second battle for Ai, which followed the battle of Jericho. Israel had been routed in the first battle due to the sin of Achan (Josh. 7-8). After repenting, and stoning Achan to death, the Israelites prepared for a second advance. "...He chose thirty-thousand of his best fighting men and sent them out at night with these orders: 'Listen carefully. You are to set an ambush behind the city. Don't go very far from it. All of you be on the alert." If one heeds the words of Moses in his blessing, and the evidence gathered from certain passages, it would not be too presumptuous to assume certain men from the tribe may have been a part of this night party, which set an ambush for the men of Ai. Joshua lured the men of Ai from the city with a smaller force. Once Ai was vacated, the hidden force of Israelites surged upon the city, taking it easily and setting it on fire (Josh. 8). Scripture does not state their role in the battle of Ai. Yet, their importance in other battles leading up to this point is almost certain. They were fierce and competent warriors. Their roles in the early conquest were extremely vital, and opened the door for the occupation of the land by their brethren. Joshua 22 describes an interesting event in the early history of Israel. It is an encounter between the Transjordan tribes on one side, and the remaining tribes west of the Jordan on the other. Joshua gathered the men of Gad, Reuben and East Manasseh together to discharge them from their service in verse 1. "Then Joshua summoned the Reubenites, the Gadites and the half-tribe of Manasseh and said to them, 'You have done all that Moses the servant of the Lord commanded, and you have obeyed me in everything I commanded. For a long time now - to this very day - you have not deserted your brothers but have carried out the mission the Lord your God gave you." This is an amazing statement of faith and obedience granted Gad by God through Joshua. Apparently the Transjordan tribes had stayed and fought through both the southern and northern campaigns in Canaan. Their mission had been ordered by God, and they had faithfully fulfilled their requirements. As a result, the fighting men of the Transjordan Israelites set out from Shiloh with "the plunder from your enemies". Joshua blessed the tribes, and commended them for being faithful to God. Joshua was sure to remind them to remain faithful, and to "hold fast to him and to serve him with all your heart and all your soul". Upon the return journey, as proposed by the map, Scripture records the tribes stopped in Geliloth and "built an imposing altar there by the Jordan". The exact location of Geliloth is in question. However, Joshua 15:7 and Joshua 18:17 use Gilgal and Geliloth interchangeably. This act nearly incites a civil war. Joshua 22:12 states the remaining tribes were so furious they had gathered at Shiloh for war against Gad, Reuben and East Manasseh. In a diplomatic attempt to prevent war, Phineas, the son of the High Priest Elazar, is sent to Gilead to confront the Transjordan tribes. The response of the Transjordan tribes is seen in verses 22-24. "The Mighty One, God, the Lord! The Mighty One, God, the Lord! He knows! And let Israel know! If this has been done in rebellion or disobedience to the Lord, do not spare us this day...No! We did it for fear that some day your descendants might say to ours, 'What do you have to do with the Lord, the God of Israel?" They argue the altar was a sign of their obedience to God, and their agreement to settle land east of the Jordan. The affair ended agreeably, and all of Israel praised God. This was a sign of the evolution of the tribes of Israel, and their progress towards unification. Rather than jump to warring with each other, the tribes exhibited Godly wisdom and discernment. God had led His people this far, He was not about to abandon them now. Even though the battles west of the Jordan had come to an end, the Gadites were not to find peace anytime soon. Their inheritance from Sihon was to bring them into many conflicts with foreign peoples. The Transjordanian tribes were surrounded and bordered by the Ammonites, Moabites, Edomites, and numerous nomadic desert peoples living on the fringe of the Syro-Arabian Desert. Their isolation from the other nine tribes further enhanced the risk these invaders posed. The map displays the nations and peoples of the Transjordan. Especially during the years between Conquest and the United Monarchies of Saul, David, and Solomon, the tribe was susceptible to invasion and oppression. Enemies could be found at every turn. The years following the conquest were unstable years for the tribes of Israel. Each tribe was primarily concerned with obtaining land not yet taken, or entrenching themselves in the land they had taken. There was no organized central government. Each tribe was left to its own, making independent decisions concerned only with their own tribal issues. Scripture is clear the Israelites were unable to drive the Canaanites and other invaders from the land completely. Different tribes faced different enemies, dependent on what part of the country they were situated in. The tribe faced threats from a variety of different people. One of the immediate threats came from the Moabites. Moab occupied the territory south of Reuben. The Moabite oppression of Israel centered chiefly around Jericho, thus affecting the tribe of Benjamin more so than the Transjordan tribes. Though Moab possessed more fields than Reuben and Gad, the land of the Israelites was much better watered than that of Moab. Initially, Moses was instructed to leave Moab alone, as its land belonged to the sons of Lot. However, the Amorites overran the king of Moab, and severely crippled his kingdom. This would become the kingdom of Sihon, which this tribe would later occupy. However, after the rupture of David's kingdom, Moab would regain their land. This would be short lived, however, as the kings of Israel, Omri and Ahab, would regain the territory in the Transjordan during their reigns. The most immediate threat, however, came from the bordering Ammonite kingdom. The Ammonites oppressed Gad and Reuben for eighteen years. The Ammonite oppression in Gilead is recorded in Judges 10:6 - 12:7. The Ammonites were closely related to Israel, however, they were extremely hostile towards the Israelites. Their hostility dated to the time of the conquest. The Ammonite aggression stemmed, in part, from the nature of their land. Ammon was hemmed in on the west by the tribe of Gad, and on the east by the Syro-Arabian desert. As is the case today, the fertile land lay to the west, occupied by Israel. To the east, only barren desert. In the southern region, the wilderness of Kedemoth separated Ammon from Moab. The land was not suitable for grazing, and much less desirable than the lands west. Despite this, the Ammonites were able to thrive as a society. Their isolation helped maintain their national identity, and they built up a magnificent city at Rabbath-ammon. The ancient ruins stand today as a testament to these hardened people in the modern day city of Amman, the capital of Jordan. Ancient aggression manifests itself on a daily basis in the region to this very day. The story of Jephthah is an intriguing one. Born to a Gileadite father, his mother was a prostitute. Upon his father Gilead's death, Jephthah was driven from his home by the wife of Gilead and his half-brothers. They did not want to give him any part of the inheritance. After being driven from home, Jephthah surrounded himself with others of like fortune, what the Bible calls adventurers and worthless fellows, depending on what version one reads. This is in exact accordance with the nature of Habiru bands. Jephthah, in essence, was a Habiru chief. Scripture records in Judges 10:4 that the elders of Gilead approached Japhthah sometime later, when the Ammonites had waged war and oppressed the people of Gilead. Jephthah was a great warrior (11:1), and had formed his band of men in Tob, northeast of Gad and East Manasseh. The elders sought him out there, and pleaded for him to come and deliver the people of Gad. Jephthah agreed to their request, upon the condition he would become head of the people. The Ammonites had been plundering the land and crops of the men in Gad and East Manasseh. They had even crossed over the Jordan, and conducted raids on various villages. Jephthah, however, urged the Ammonite king to cease his raids. The Ammonite king claimed Israel had stolen his land when they came out of Egypt. 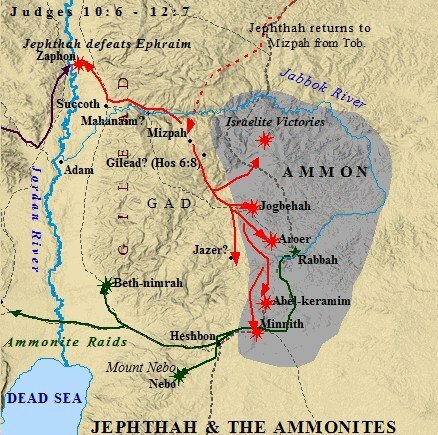 Jephthah correctly asserts the real history behind their occupation, reminding the Ammonite king his land had been taken by the Amorites of Sihon and Og. Israel had, in turn, taken the land from the Amorites, not the Ammonites. This did not suit the Ammonites, however. In Judges 11:29, the Spirit of the Lord is said to have come upon Jephthah, and he lead his men, surely accompanied by the fierce Gadite warriors, against the Ammonites. Jephthah subdued Ammon, destroying twenty of their towns. His battles, however, were not over. His own countrymen, from the tribe of Ephraim, became angry at him for going to war without them. Ephraim marched on Jephthah at Zaphon, located within Gadite territory. This proved to be a fatal mistake, as they were slaughtered by Jephthah's men. Jephthah went on to rule Israel from Gadite territory for six years. Jephthah, perhaps, is the best example of the Habiru appearing in the Bible. The circumstances surrounding his exile and return are exactly how the Habiru are described in ancient writings, namely the Amarna Letters . It is quite likely the Israelites were viewed as Habiru by the other nations, and Jephthah provides a clear cut example of the similarities between the Habiru and the Hebrews. The tribe continued to prosper after the Ammonite invasion. During the time of David, they sent men to him in his time of need. The incident is found in I Chronicles 12. David had been banished by Saul to Ziklag, in the Negev. While there, however, he formed his first army. Men from all over Israel joined him. The tribe of Gad is described in I Chronicles 12:8. "Some Gadites defected to David at his stronghold in the desert. They were brave warriors, ready for battle and able to handle the shield and spear. Their faces were the faces of lions, and they were swift as gazelles in the mountains." These men appear Spartan-like in their description here. They were fierce and terrible warriors on the battlefield, afraid of no one. They were fast and quick, athletic in their movements, and skilled in their techniques of war. They fought with shield and spear, were skilled with the sword, and could use the bow if necessary. They were very versatile and athletic warriors. Further description is given of them in verse 14-15. "These Gadites were army commanders; the least was a match for a hundred, and the greatest for a thousand. It was they who crossed the Jordan in the first month when it was overflowing all its banks, and they put to flight everyone living in the valleys to the east and to the west." These men were the Marines of the Israelite army. They had led battles in the Transjordan against the mighty kings of Sihon and Og. They had led the charge on Jericho, and then fought in the southern and northern campaigns. They were a tribe born of war, and had fine tuned their craft over the course of the following decades of conflict. They were daring men as well, which all great warriors are. Crossing the Jordan during flood stage was a risky and dangerous task. The first month would have been in March, when the spring temperatures begin to melt the snow in the mountainous highlands of Gilead and Bashan. These melting waters would have gathered in the Jordan, causing the river to swell drastically and overflow its banks. By undertaking such a dangerous task these warriors were battling the very forces of nature. However, it was because of the danger involved, that such attacks were not expected by enemy foes. The Gadites used their bravery and skill to gain surprise on their enemies by attempting these dangerous feats. David recognized their valor and skill as warriors, and made the men of Gad commanders. This elite contingent of warriors sent by Gad would be followed by another contingent of warriors later, when David had gathered in Hebron in hopes of gaining the crown. At Hebron, the Transjordan tribes sent 120,000 men to serve David. Even after the time of David, the tribe engaged in conflicts with various peoples east of the Jordan. One such encounter proved prosperous for the Gadites. As stated previously, Gad lost much of its land to Moab after the dissolution of David's empire. However, under the capable military leader Omri (882-871 BC), Israel was able to recapture the land of Gilead. An inscription found from King Mesha of Moab in Dibon attests to the fact Omri reclaimed the land east of the Jordan. The tribe was listed specifically in I Chronicles 5 during the reign of kings Jotham of Judah (756-741 BC) and Jeroboam II of Israel (787-747 BC). During the reigns of Jotham and Jeroboam, Scripture records a conflict between the Transjordan tribes and desert nomads living on the fringes of the Transjordan. This encounter would have taken place between the years of 787-741 BC, based on the reigns of Jotham and Jeroboam. Their enemies in this conflict are the Hagrites, Jetur, Naphish and Nodab. These people were desert nomads that occupied the desert fringes east of the Jordan. The Hagrites were an offshoot of the Ishmaelites. The Ishmaelites are believed to have centered south of Edom. They were associated at one point with the Midianites, the descendants of Moses's father-in-law Jethro. However, the Ishmaelites were not limited to that one area. Scripture also records they pitched their tents all throughout the Transjordan. Thus, clans of the Ishmaelites living near Mt. Herman, and on the eastern fringes throughout the Transjordan, complies with the Biblical text. The coalition of forces that Gad faced was surely large in number. Jetur, Naphish and Nodab are believed to have existed near Mt. Herman, in the north. It is also likely they occupied some of the territory belonging to the three Israelite tribes. The Hagrites were located east of Ammon. Their land bordered the tribes of Gad and Reuben, as well as the kingdoms of Ammon and Moab. They, too, were desert nomads, roaming from one land to another based on seasonal changes. They would raid the neighboring countries from time to time. These raids were not limited to the Israelites only. In I Chronicles 5:18-19 the Transjordan tribes go to war with these desert nomads. "The Reubenites, Gadites and the half-tribe of Manasseh had 44,760 men ready for military service - able-bodied men who could handle shield and sword, who could use a bow, and who were trained for battle. They waged war against the Hagrites, Jetur, Naphish and Nodab." The Gadites had united with their Transjordan brethren, and mustered a large army. The number of the enemy forces is not given in Scripture. However, the contextual evidence seems to suggest it was a large and capable force. In fact, the men of Gad and company seem to have encountered serious problems early in the battle. This seems to be the implication in verse 20. "They were helped in fighting them, and God handed the Hagrites and all their allies over to them, because they cried out to Him during the battle. He answered their prayers, because they trusted in him." This verse seems to imply the battle went against Gad initially. However, they proved faithful by calling out to God for help in the midst of the battle. God, in turn, responded faithfully to the tribes of the east by handing the Hagrites and all their allies over to them. In the face of a large enemy, and despite the battle perhaps going against them early, the Transjordan tribes responded in faith, and God rewarded that act of faith. "They seized the livestock of the Hagrites - fifty thousand camels, two hundred fifty thousand sheep and two thousand donkeys. They also took one hundred thousand people captive, and many others fell slain, because the battle was God's. and they occupied the land until the exile." The spoils of this war were exceedingly abundant. The tribes of Gad, Reuben and the half-tribe of Manasseh confiscated livestock and slaves. The Hagrite coalition was soundly defeated, not by the strength of Israel, but Scripture said it was God's battle. No alliance, army, people, or leader can stand up to God in battle. By acting in faith, and calling out to Him, the tribes of the Transjordan were blessed. Conflicts of this nature were common in the Transjordan. 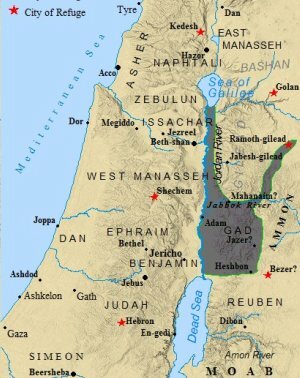 With the division of the nation into Israel and Judah, the tribes of Gad, Reuben and East Manasseh fell under the dominion of the northern kingdom of Israel. The size and scope of this kingdom lent it to a weakened central government. The tribes in the north, like Naphtali for example, faced similar problems as Gad in the Transjordan. They, too, were surrounded by enemies on all fronts. This weakened the northern kingdom's ability to effectively rule and protect all of its territory, and eventually played a significant factor in the Assyrian conquest and exile of Israel. King Jeroboam of Israel foresaw this problem of protecting the northern kingdom. Upon the dissolution of the United Monarchy, Jeroboam sought to firmly establish the northern kingdom. In an attempt to do this, he fortified Shechem in Samaria, due to its close proximity to the southern kingdom's capital of Jerusalem . I Kings 12:25 also states he fortified Penuel, east of the Jordan. Penuel was where Jacob was re-named Israel by God. It lay within the borders of Gad. Rehoboam also knew Israel would have a hard time protecting its land in the Transjordan. Thus, by fortifying Penuel, he was enhancing the ability of the kingdom to defend the Transjordan by stationing troops there. In essence, Penuel would have become similar to a modern day army base. Gad surely welcomed the building project. However, this would prove futile against the future invasions of Aram, Damascus, and ultimately the Assyrians. 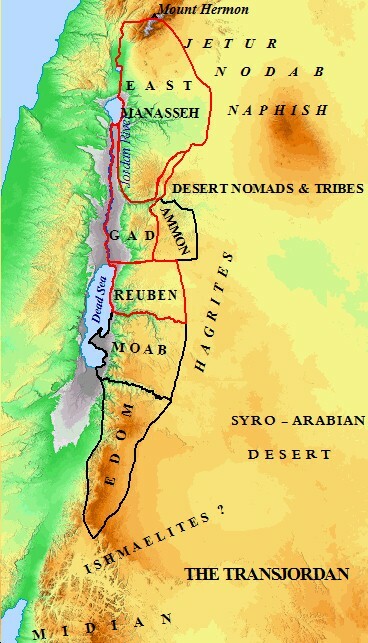 Not only was Gad involved in disputes with desert nomads, but the tribes of the Transjordan found themselves in constant battles with the major powers of the time. The first encounter with a major power and Gad is listed in II Kings 10:32-33. The time frame involved is during the reign of Jehu, king of Israel. He reigned from 845-818 BC. In 841 BC, Hazael king of Aram-Damascus waged war against the northern kingdom of Israel. Scripture equates this war with divine judgment from God in verse 32. "In those days the Lord began to reduce the size of Israel. Hazael overpowered the Israelites throughout their territory east of the Jordan in all the land of Gilead (the region of Gad, Reuben and Manasseh), from Aroer by the Arnon Gorge through Gilead to Bashan." The tribe of Gad, thus, fell under the hand of king Hazael. One must remember that Jeroboam I set up golden calves in Bethel and Dan. These idols were to rival the one true Temple in Jerusalem. God, obviously, was not happy with Jeroboam and the northern kingdoms worship of these idols. The foreign invaders of Gad and company, thus, were divine instruments of God to punish the north. Hazael vanquished the Israelites in the east, and took over the land of Gad, Reuben and Manasseh for his kingdom. The northern kingdom of Israel, in effect, lost all of its possessions east of the Jordan. Eventually Gad regained their land, as recorded in II Kings 13:24. Upon the death of Hazael, his son Ben-Hadad rose to the throne of Aram. Joash ascended to the throne of Israel upon the death of his father, Jehoahaz. Thus, during the reign of Joash (802-787 BC), Israel regained all of its territory in the Transjordan. Ben-hadad was defeated, and the land of Gad, though briefly, returned to its rightful owners. The final blow to the tribe of Gad, as well as the other tribes of the northern kingdom, was to be delivered by the Assyrians. The incident is recorded in II Kings 15:29. "In the time of Pekah king of Israel, Tiglath-Pileser king of Assyria came and took Ijon, Abel Beth Maacah, Janoah, Kedesh and Hazor. He took Gilead and Galilee, including all the land of Naphtali, and deported the people to Assyria." The end of the northern kingdom was in sight. The tribe of Gad, once again, lost their land. This time, however, the Assyrians deported the residents of the land back to Assyria. This took place during the reign of Pekah, spanning from 735-732 BC. The invasion of Tiglath-pileser III took place around 734 BC. However, the Assyrians would continue their war with Israel under Shalmaneser V (727-722 BC) and under Sargon II (725-705 BC). It was under Sargon II that the destruction and deportation of the northern tribes was completed. Most scholars agree that by 720 BC, the northern kingdom of Israel was no more. The Transjordan tribes joined their northern compatriots in exile. These tribes became the 10 Lost Tribes of Israel. They were dispersed, placed in various towns in Assyria, and their land was re-populated by foreigners. The valor and might displayed by Gad over the course of its history faded into the annals of Jewish lore and history. "Concerning the Ammonites: 'This is what the Lord says: Has Israel no sons? Has she no heirs? Why then has Molech taken possession of Gad? Why do his people live in its towns? But the days are coming,' declares the Lord, 'When I will sound the battle cry against Rabbah of the Ammonites; it will become a mound of ruins, and its surrounding villages will be set on fire. Then Israel will drive out those who drove her out,' says the Lord." God has not forgotten the tribe of Gad or the other nine tribes of Israel. The day will come when they resettle their lands, and drive out those that drove them out. It was the sin of Gad and the northern tribes of Israel which brought about their ultimate demise and exile. However, it will be the faithfulness of God that restores Gad and Israel in His future kingdom.